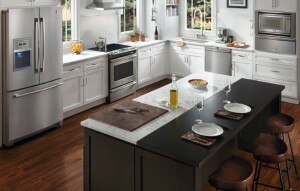 Cody’s Appliance Repair is factory authorized for warranty services for Frigidaire Appliance Repair. What that means for you is that our company undergoes continual training and certification on all Frigidaire appliance products. We are licensed, trained, and vetted by the manufacturer for your continued safety and contentment. The first electric refrigerator was offered for sale in 1913. In 1915, Alfred Mellowes designed a new version of the original unit, and in 1916 the Guardian Refrigerator Company was organized to manufacture Mellowes’ refrigerator. General Motors saw the potential of this company and purchased it in 1918 and gave it the name Frigidaire. Mass production techniques were applied, production facilities were improved and additional sales offices were opened. It was then that Frigidaire took off as a company. Along the way, it has recorded quite a few “firsts” and contributed immensely to the industry as a whole. Frigidaire is owned by the Electrolux Corporation, presently. If you live in Boise, Eagle, Meridian, Nampa, Caldwell, Star, Middleton, Emmett, Kuna, Garden City or Horse Shoe Bend, call us today at (208) 938-1066 for certified Frigidaire appliance repair; or request service right from our website! We are here to help.